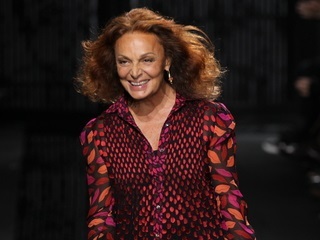 Gioia Diliberto's tome arrives on the heels of last fall's DVF memoir. The author of Diane von Furstenberg: A Life Unwrapped, new in bookstores today, is Chicago-based writer Gioia Diliberto. So naturally, it makes sense to highlight some local coverage. Unfortunately, von Furstenberg didn’t have a big second hit to immediately follow the wrap dress. Though she remained a fixture in New York City’s high-powered social whirl, she would reach a very low point in her career when she resorted in the early 1990s to hawking some reasonably-priced creations on QVC. Diliberto has written several other biographies, as well as a pair of novels. Her latest effort comes on the heels of her subject’s autobiography last fall, titled The Woman I Wanted to Be.